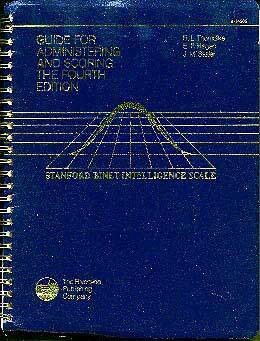 This image is the title page of the 1937 Stanford-Binet Intelligence Scale for Children. (The cover is blank). This test was highly sophisticated for its time, analogous to a classic car. It had a representative standardization sample of 3,000 and offered parallel forms (Form M and Form L; The forms were named after the test creators). Portions of the sample were gathered in Indiana and Kentucky. This quote from the manual with regard to collecting the standardization sample gives a glimpse of the era: "The problems of testing in rural communities are many and varied. At some seasons of the year the roads in some of the rural sections were all but impassable; the schools, most of them two- or three-room establishments, had few children at exact ages [needed for the sample] and the next school district was many rough miles away; homes where the pre-school children were tested were often inaccessible and miles apart. Nevertheless, few of the children under fourteen were missed, and the willingness of the teachers and parents to cooperate with the "testing teacher" was very heartening. Indeed, we found everywhere in both rural and urban communities a most cordial response and willing cooperation. (p. 20)"
Comparing the sample characteristics to modern tests illustrates the changing demographics and cultural sensitivities of the United States. The 1937 sample (using 1930 census figures) was "all American-born white children." They only discuss nationality of parentage (50% were American-born and the vast majority of the remaining are of European descent). This reflected the prevailing laws and attitudes regarding immigration, as well as the vast influx of immigrants following WWI. A recent revision of another intelligence measure (the Wechsler Intelligence Scale for Children-III) used 1988 census figures to build a sample approximately 70% White, 15% Black, and 11% Hispanic. Adapting to diversity is not merely an ideal but a reality of modern American life. 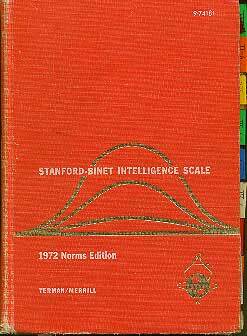 For those interested, here is the cover and title page of the 1960 Stanford-Binet revision (with 1972 norms). This was a very child friendly (and examiner rough) individual intelligence test. For answers to Frequently Asked Questions on Tests click here (testfaq.htm). All contents © since 1996 by Sally Kuhlenschmidt. Copy only with permission. Website created: June 1996. Page Created: March 1999; Last Modified: September 17, 2010.